This fun Christmas post is in honor of my kiddos. The Christmas season is magical for children! I have 2 boys and they have been OBSESSED with LEGO Minifigure Family for, well, since they were born! Sometimes you just have to have fun on Sand & Sisal and let your LEGO on! When my kids shop for LEGOS they seriously look at what LEGO Minifigures are featured. Kids love minifigures, so when LEGO sent me this awesome app to transform our family into personalized LEGO peeps, how could I refuse? 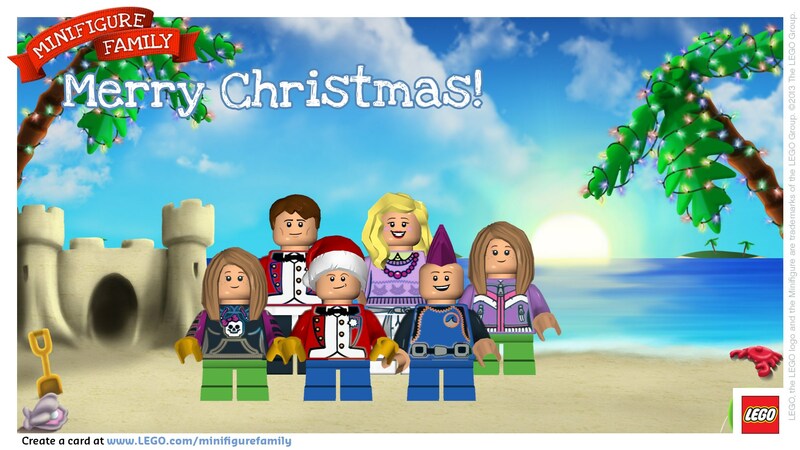 You have the opportunity to customize each of your family members with different skin tones, hair styles and outfits and transform them into the most rockin’ Holiday LEGO Minifigures ever! DISCLAIMER…. I let my 6 year old design each family member, so ummm girls…. if you don’t like how you look, blame it on your little bro! I think we were all in agreement that out of all the backgrounds to choose from, a warm and tropical Christmas beach scene would be right up Sand & Sisal’s aisle! Don’t you agree? I had no idea you had kids that young!